Truffles anyone? 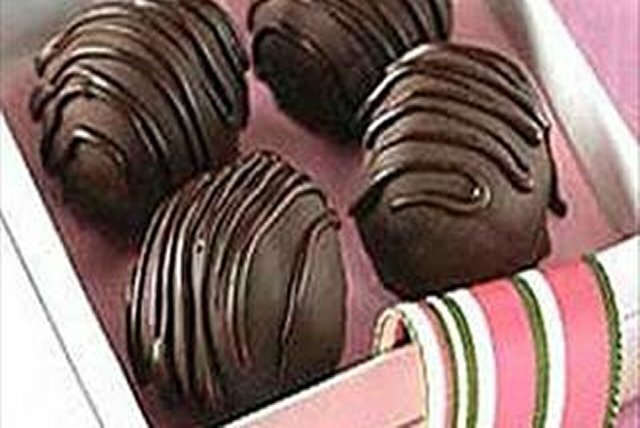 Melted chocolate, cream, butter and liqueur are blended, shaped into balls and dipped in a chocolate coating for easy, decadent candy truffles. Chop 1 pkg. chocolate. Bring cream to boil in medium saucepan on medium heat; remove from heat. Add chopped chocolate, butter and liqueur; stir until chocolate is completely melted. Transfer to freezerproof bowl. Freeze 2 hours or until firm enough to handle. Roll chocolate mixture into 24 (1-inch) balls, using teaspoon to portion chocolate mixture for each ball; place on waxed paper-covered rimmed baking sheet. Freeze 20 min. Chop remaining chocolate; place in heatproof bowl. Place over pan of simmering, but not boiling, water over medium heat. (Be careful to not let water drip into the chocolate or it will become grainy.) Stir 3 min. or until about 2/3 of the chocolate is melted. Remove from heat; stir until chocolate is completely melted. Dip balls, 1 at a time, into melted chocolate; return to baking sheet. Drizzle with any remaining melted chocolate. Refrigerate 30 min. or until firm. Omit 1 pkg. of chocolate. Prepare chocolate mixture, shape into balls and freeze 20 min. as directed. Roll in icing sugar or ground nuts. Substitute 1 Tbsp. orange zest for the liqueur.